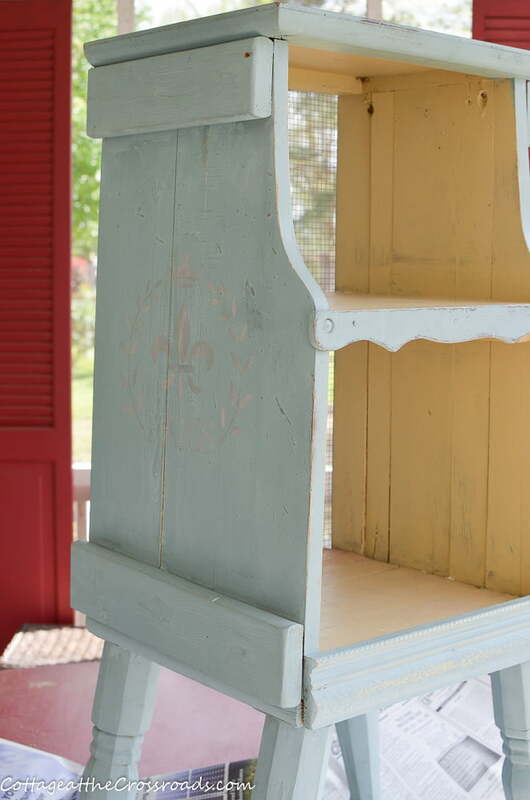 A chubby, rustic piece of furniture found at a consignment shop gets easily transformed into a cute-as-can-be cottage style magazine rack. Hello friends! 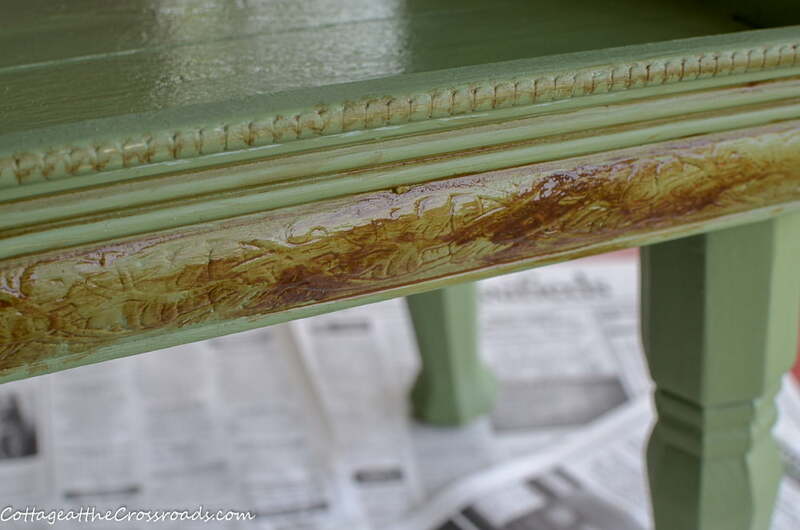 If you are a fan of cottage style furniture, then I have a treat for you today. Recently we were visiting friends in Mt. Pleasant, SC, and we stopped in a consignment shop. I spotted a unique piece of furniture in the back and as soon as I saw it, I knew it was going home with me! It was rustic with chubby legs and had wire mesh in the back. 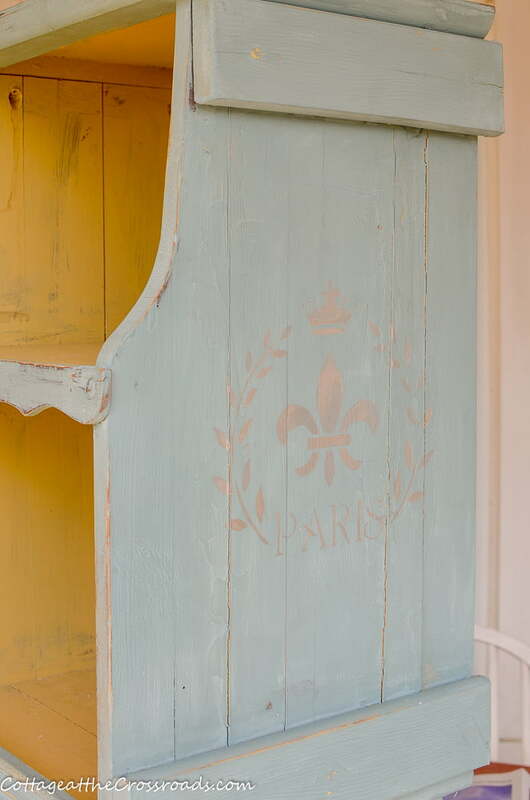 It was already painted blue with French Country flair. I could tell by the tag that the piece had been in the shop for many months so we offered a low cash price to take it off their hands. When we got it home, I immediately put it beside the fireplace and filled it with magazines. I’m not sure what its purpose had originally been, but it was just the right size for a magazine rack. But the more that I looked at the piece, I thought that those chubby legs were too long! So about 2 inches were taken off. Next, I decided that I was going to repaint it. There really was nothing wrong with how it was painted other than the blue did not look good with some other blue items I have in our family room. I almost hated painting over the fleur-de-lis stencil on the sides. 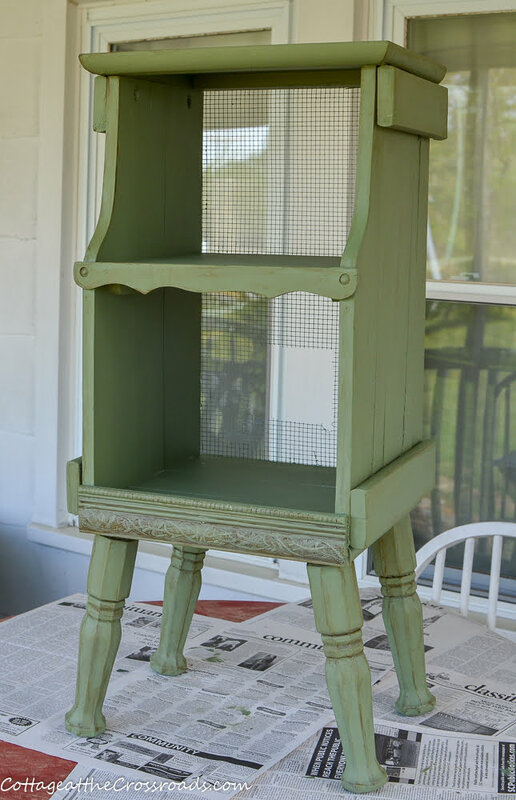 But, I decided that my cottage style magazine rack needed to be green. I mixed up some chalky style paint using leftover paint that I already had. 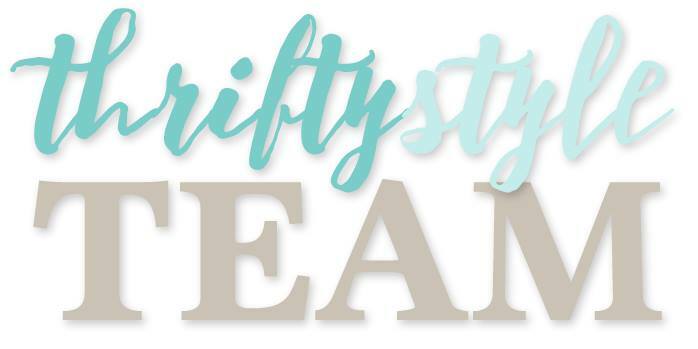 If you’d like my formula for making your own chalky paint, you’ll find it in this post: A Thrifty Repurposed Vanity. 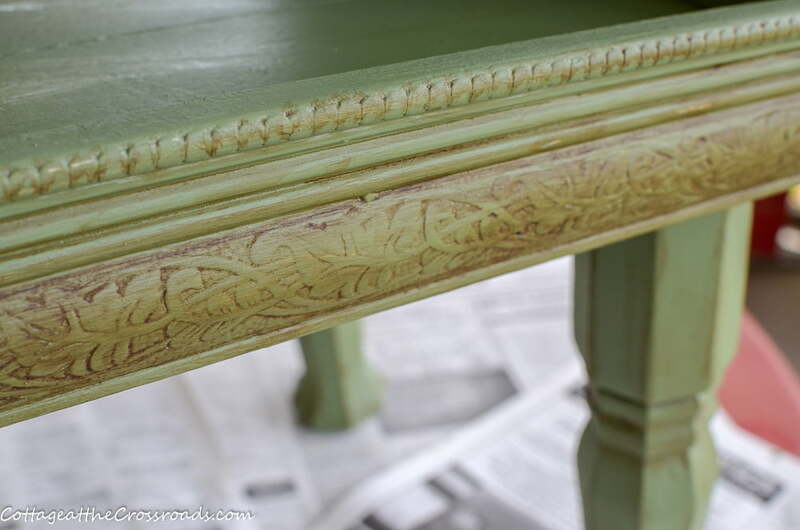 Once I got my piece painted green, I decided to highlight the features with paint instead of using dark wax. Using burnt umber acrylic paint, water, and a small art brush, I filled in the areas that I wanted darker. First I painted the indentations on the front. I smeared a lot of it on this section, and then I used a damp paper towel to remove the extra, leaving the umber paint in the crevices. Here you can see the process a little better, and you can also see how I did the same on the edges of the legs. 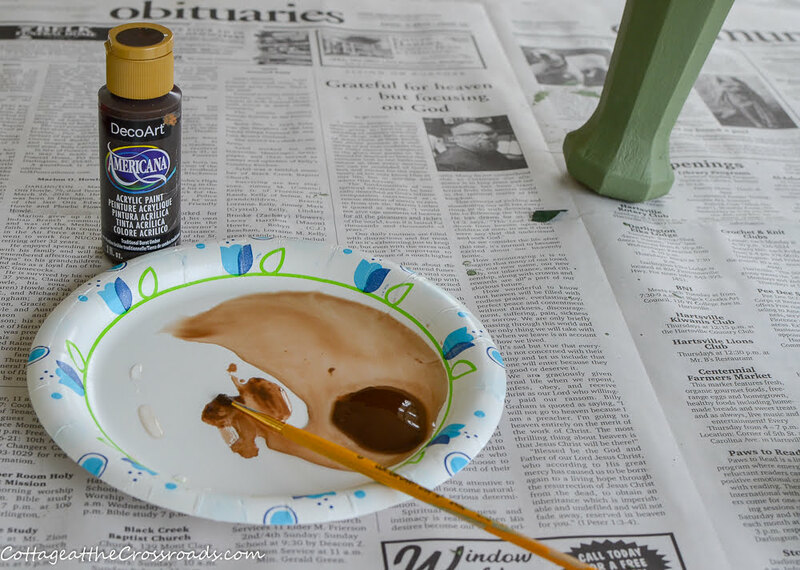 The good thing about using watered-down acrylic paint to highlight the features is that you can always wipe it off if you think you’ve added too much, or you can add more green paint on the raised areas. Here’s the final paint job. I chose not to distress this piece and I still need to add clear wax to protect it, but isn’t she cute? Her cut-off legs look better proportioned to her body, don’t you think? 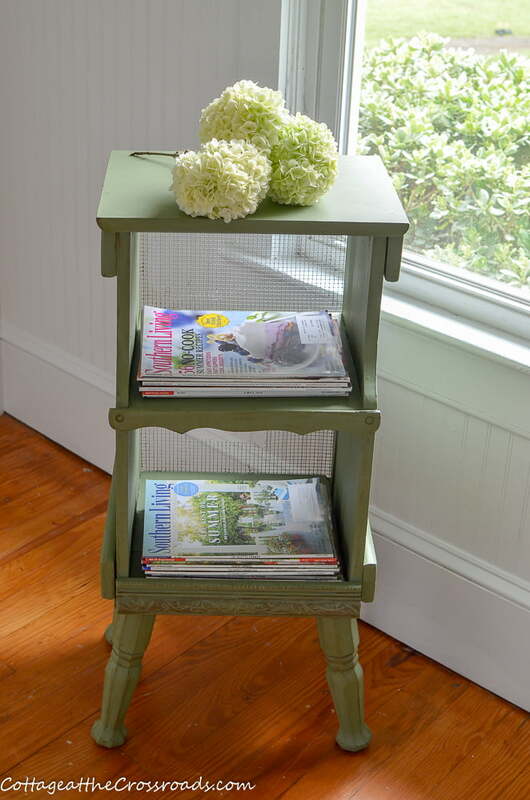 I just love the homemade look of this cottage style magazine rack! To style her, I added a few blooms from our Chinese viburnum bush to the top. If you follow me on Instagram, you probably saw the bush loaded with blooms. What? You’re not following me yet? 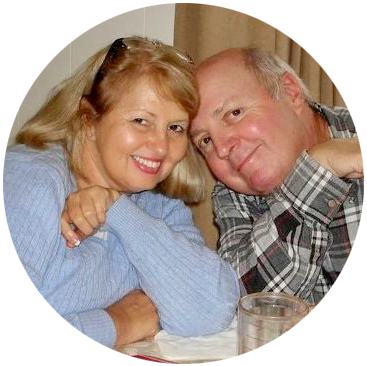 Click HERE to remedy that right now! 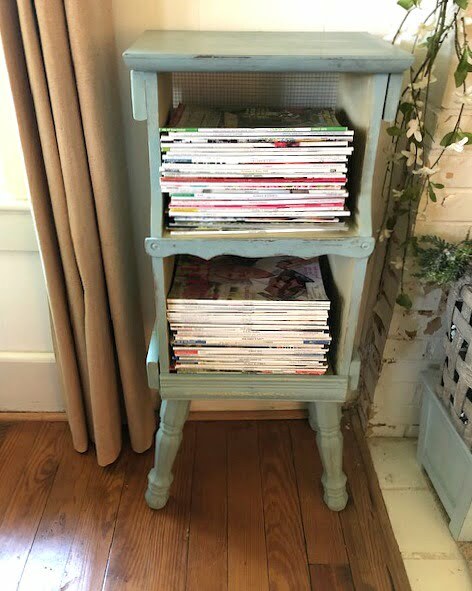 I hope you enjoyed seeing my painted cottage style magazine rack today, and if you’re looking for more thrifty projects, you’re in luck! 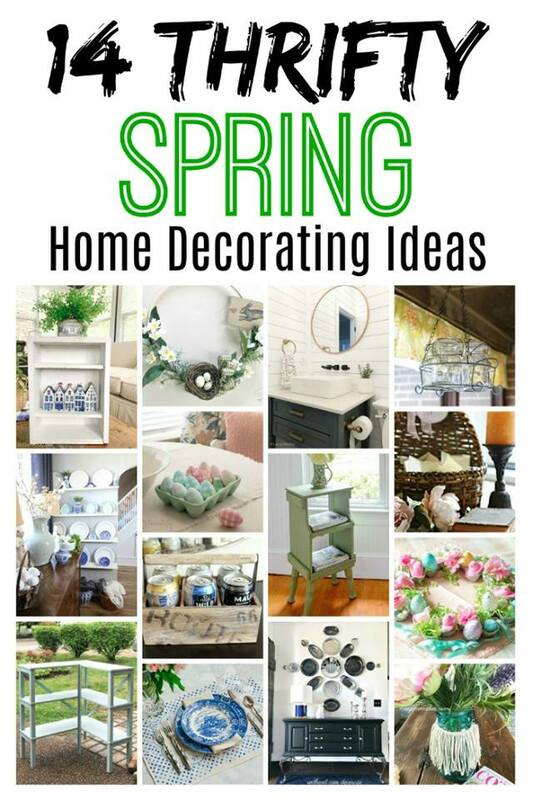 Below you’ll find 13 more thrifty DIY spring projects from the other members of the Thrifty Style Team. Just click on any of the links below to find more inspiration. Amazing how different it looks in green. Guess you can’t tell me the color if you mixed it up yourself …. I like it alot. Everything you create is awesome. That little rack is adorable! Love the color !!!! 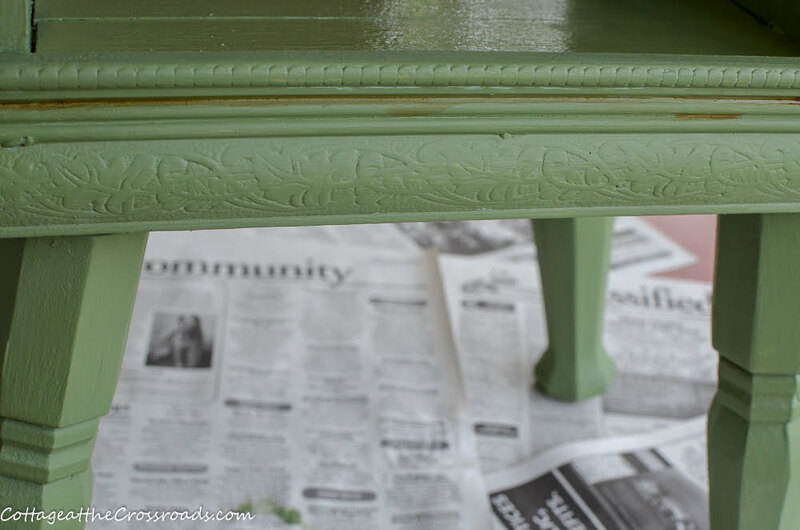 That is such a sweet green color you chose for this project Jane! Wow the green gives your piece a whole new life! I like the way you added the paint for accenting the details. 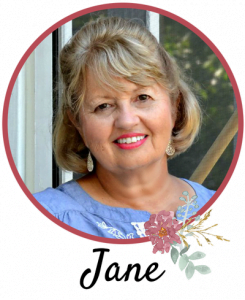 Always something pretty and inspiring here on your blog, Jane. I love it. So cute! 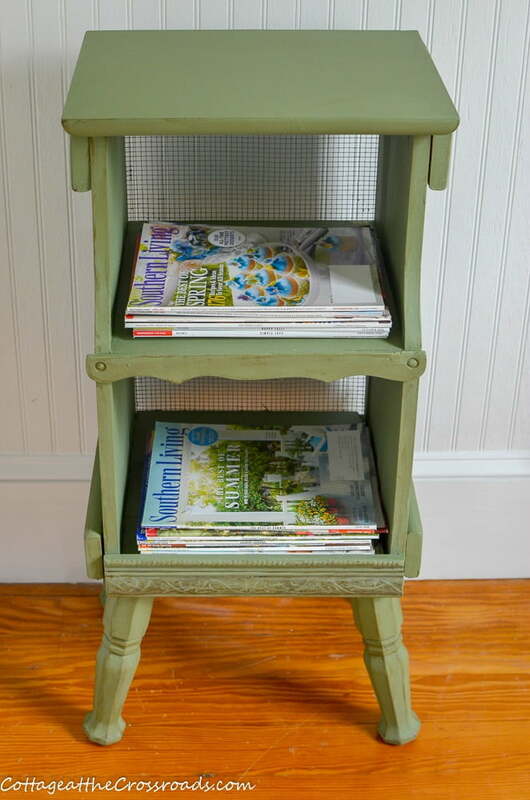 I love painted furniture like this and it really does make a great magazine rack. So much smarter than a regular magazine rack because it can hold so much more! Jane, this is super cute. I want one!! I love the green and the way you antiqued certain areas. 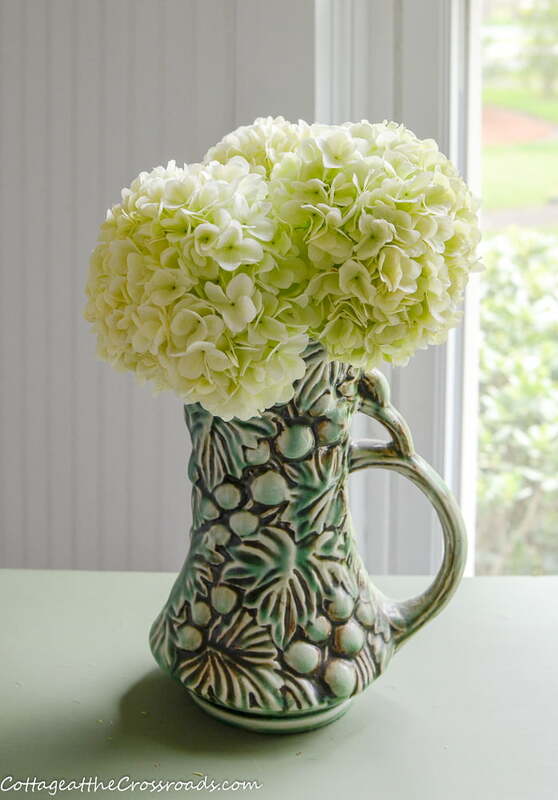 This is such a pretty redo, Jane, and the green is absolutely cottage perfect! Jane total Thrift Store Score! 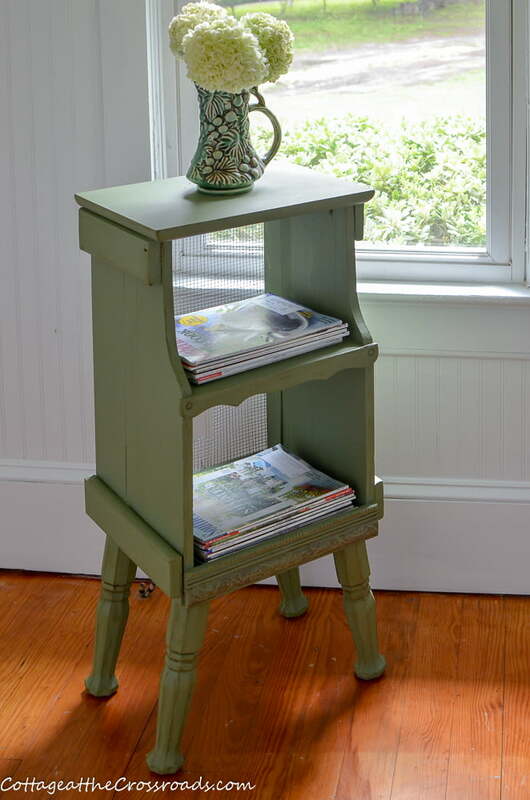 Love the spring green paint and that you’re using it for a magazine rack! I love the new color, and I agree it fits magazines perfectly. Pinned! That is just darling. I love the green. I do wonder what its original use was though. I think it is the perfect magazine rack though.